As Usain Bolt won his seventh gold medal at Rio de Janeiro's Olympic stadium to consolidate his status as the most decorated sprinter of all time, there was a corner of the Games' host city that paid tribute to his black, gold and green roots. In Jamaica House, based at Rio's Jockey Club, the DJ stopped the reggae only for the 100m final, which Bolt won in 9.81 seconds. The crowd, packed into the sell-out venue, erupted as Bolt overtook Justin Gatlin in a tight race before the DJ turned to West Indies cricketer Dwayne Bravo's "Champion" and set the house dancing once again. It was a proud moment for Jamaica. For Bolt's parents, pride has long been synonymous with humility. Wellesley and Jennifer still live in Jamaica's Trelawney Parish, where Usain grew up. Bolt senior still runs the family store there. "I need something to occupy my time so I don't get lazy, and that's why I still work at the shop," Wellesley told journalists with a mischievous smile on the eve of Bolt's first Rio 2016 appearance. Jennifer Bolt was slightly more reserved but the pair soon commanded a room full of international press with their warmth and honesty. Already at their third Olympic Games with their 29-year-old son, Bolt's parents said his talents had been obvious from an early age. Jennifer Bolt warmed to questions about her son's late arrival when he was born and admitted it was probably the only time he was ever slow. "After he was born, I noticed that he was fast because after three weeks he was pushing because he was so strong," she said. "He weighed 9.5lb at birth. One day I left him on the bed, and when I came back he was close to falling off, so from then I was saying, 'What kind of a child is this? I've never seen that'." Both Wellesley and Jennifer Bolt were also runners, and so it was only natural that the sprinter would follow in their footsteps. Aged 10, Bolt was outpacing his parents. At 12, his extraordinary speed was evident. He was also a keen footballer and cricketer, so his parents kept him on track for athletic success, giving him a yam-heavy Jamaican diet. "In Trelawney, we grew yam as our main crop so Usain got a lot of yam to eat," Jennifer Bolt said. "I don't know if it's really secret but I know it's good." She added that Bolt once had to run back to the family home to pick up his lunch after forgetting it on his way to school. "It was at the age of 12 in primary school that he started to compete in school sports day, and he was always on top, always winning against his classmates. From there, we noticed that he would be a great runner," she added. "I think this was an inborn thing, a natural talent. "Usain is an obedient child. He listens to us. Sometimes he did little things, as children do, but he did listen to us and we're glad that he did." Bolt has not yet visited Rio's Jamaica House, which was packed with medallists from around the world during the 100m final. Andrew Holness, the Jamaican prime minister, also paid a visit. But there is a chance the Jamaican superstar could make an appearance to celebrate his 30th birthday, which coincides with the closing ceremony on August 21. "We're such a proud people," said Jason Hall, deputy director of tourism for the Jamaica Tourist Board. "We are used to punching well above our weight. He's essentially the most visible figure in Jamaica today. Bob Marley was that person but Bolt transcends that. You listen to Bob but you watch Bolt. He captures your imagination." 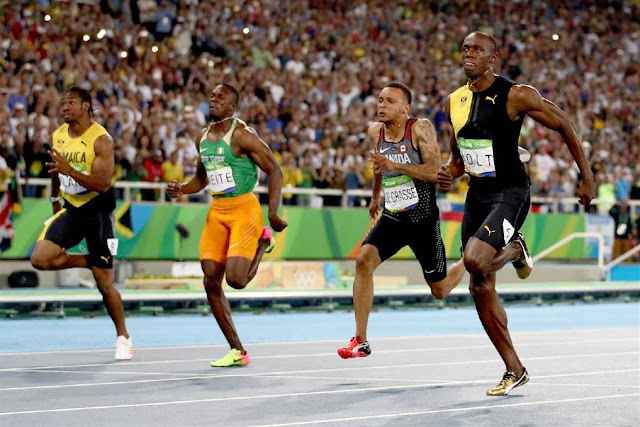 Since Beijing 2008, when Bolt won his first trio of gold medals, he has entertained crowds not only with his form on the track but also off it. After crossing the finish line on Sunday, the biggest cheer at Jamaica House came when he pulled his famous "Lightning Bolt" pose for the cameras. Wellesley Bolt remarked his son had picked up the famous moves and poses from him. Jennifer Bolt said the character that the world has come to know as Bolt has always been the same. "He's playful at home," she said. "I haven't seen any difference. I think his personality is just the same." Bolt's success had helped his home community, Jennifer Bolt added, where schools and health clinics had been upgraded, and said that now the sprinter was on the brink of retirement, he might be able to live a more normal life. "I don't think it'll be sad but I think he'll be happy because he'd like to live a normal life. He can't move around as he wants to because of people getting at him, not to hurt him, but just to get close to him," she said. "I knew it would be a long journey because Usain is a real competitor. He likes to compete and he told me that he doesn't like losing, so I knew that this would be a long way. "It has changed us because here we are in front of so many cameras and it's really amazing to see so many people and us here just talking. It's really a good thing that he has bought us here." Celebrating Father's Day in Brazil with his son at his third Olympics, Wellesley Bolt said his son had already earned his status among all-time sporting greats. "I think he's already one of the greatest athletes because it takes a lot for an athlete to win back-to-back gold medals, three times in World Championships and the Olympics," he said.